In our last blog, we had looked at the important resources that aid in arriving at a right eCommerce personalization strategy for your business. We had also discussed how the concept of eCommerce personalization evolved and the means to optimize the resources on hand to set the ball rolling on actual personalization. The emphasis, in both the blogs, has largely been how eCommerce personalization is beneficial for end customers. In this blog, we will look at the value proposition it presents for your (online retailers) business in that process. More than anything it is a given that businesses should primarily work on replicating an online shopping experience which mirrors the exact same offline experience which is obtained from a physical store. 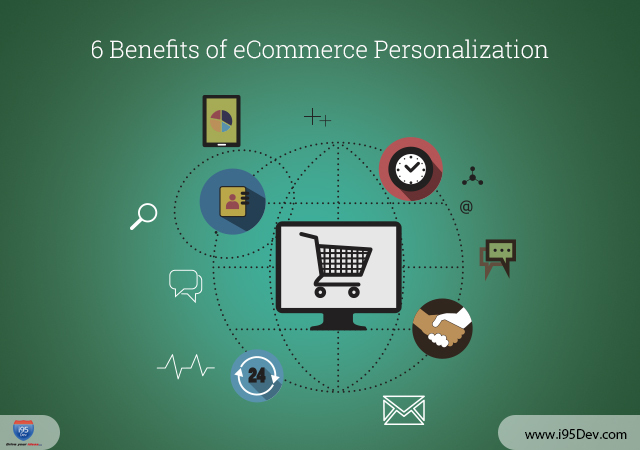 What eCommerce Personalization can do for your Business? According to a study conducted by Demand Gen, Leads who are nurtured with targeted content produce a 20 percent increase in sales opportunities. Simple and straightforward, personalization helps you better target your customers and catch their attention long enough to entice a sale. In Psychology, there is a concept called, “Selective Attention” – it is defined as an act of focusing on a particular object for a period of time while simultaneously ignoring irrelevant information that is also occurring. In a research, it was found that our focus and attention is naturally inclined towards things that we value or are invested in. The consumers today are extremely volatile and have a very little attention span; therefore, needless to say, your window of opportunity is also as limited. Personalization can help businesses improve conversions by presenting the information, you want to share with them, in a manner relevant to them. Adopting a focused approach, customized to their behavior and likings, to promote a particular product will definitely appeal them and helps in a successful transaction. Consider this – according to a study by Infosys, 86% of consumers and 96% of retailers said that personalization has some impact on their purchase decisions. With specific related information flowing out to your customers, there is a higher chance of them indulging in shopping and buying more per visit. Consider this – A user who is looking to buy a laptop from your website can easily be engaged for accessories such as the laptop bag, a mouse, a cooling pad etc. At a strategic point of nearly completing the sale, if you could throw in a few product recommendations the chances of you being able to sell more products, in the same transaction, go up significantly. We have already seen how frustrating a disjointed connection with a website can be. If your customer is able to relate to your website better, he or she will automatically spend more time on it and is also tempted to come back in the future. According to a research, nearly 60% of customers prefer it if an online store remembers their contact details and purchase information. The increased engagement directly adds to the bottom line of the company and also save you marketing dollars that brands spend in ads to increase customer engagement. In a research conducted by HubSpot, it was found that Calls-to-action targeted to the user had a 42 percent higher view-to-submission rate than calls-to-action that were the same for all visitors. eCommerce personalization helps build a long-term relationship with consumers through customized landing pages, targeted ads, and curated email messaging, which helps users find specific content that appeals to their needs. This projects the businesses in the light of being customer centric as against business-centric. This benefits businesses by improving customer satisfaction and the lifetime value associated with each customer. A personalized user experience makes you customers feel special by demonstrating that your company and actively listens to them and puts in the effort to make their lives easier. “A study by Exact Target and Forrester Consulting found that 84% of marketers believe that personalization positively impacts customer retention and loyalty”. A loyal customer can effortlessly be lured into more business and not just by customer alone – for most brands loyal customers are their biggest influencers and brand advocates who not only purchase the products themselves but also recommend them others. According to a study, reducing attrition by just 5 percent can boost profits by 25 percent to 80 percent. All of this paves the way to a healthy sustainable online business environment. With the internet teeming with competition, what can possibly differentiate your website from your competitor is the user experience you offer your customer. eCommerce personalization helps you arrive at just that; it is but the obvious that a friendlier eCommerce website that appeals on a higher ground to the user. If you have read through in detail, you may see that each one of the benefits that have been discussed connects one to the other with respect to what it offers to your business as well as the user. All of which work together in different ways towards one goal, which is maximizing revenues. Let us know how your brand has benefited from personalization by commenting below. Stay tuned for our next blog on eCommerce personalization! !